Wendy Vogel contributes to our collective glossary-building with an entry on CONSCIOUSNESS, the first of seven successive posts on terms associated with social practice, initiated via an open call. While CR has been criticized as a tool primarily used among an already privileged group of women (white and middle class to upper middle class) and one that practices (for better or worse) what Gayatri Chakravorty Spivak has helpfully termed “strategic essentialism,” its effects reenergized a social practice in art from the 1960s onward. Perhaps the most potent example is the co-emergence of the Art Workers’ Coalition (AWC) with second-wave feminism. The loosely affiliated group of artists in AWC created an ambitious list of demands reflecting their own identification with the Marxist idea of the art “worker,” effectively reconsidering the autonomy of the art object in relation to the creator’s ambiguous status in a capitalist economy. The group’s many demands included increased representation of women and artists of color, museum day care, artist fees, and an end to unjust political conflict. 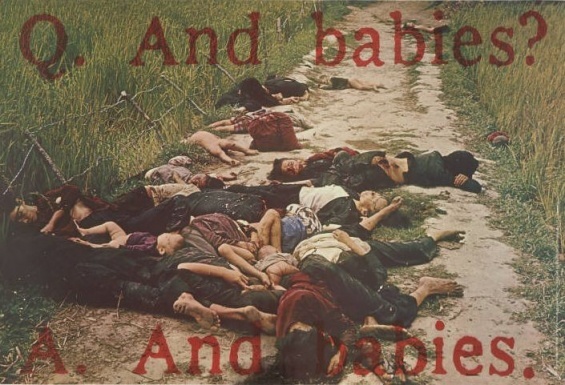 The group created iconic graphic campaigns, such as the unforgettable anti-Vietnam War poster Q. And babies? A. And babies. of 1970. They also mobilized performative actions, such as the Guerrilla Art Action Group’s brand of political theater, and engaged the Museum of Modern Art’s administration in conversations about the political affiliations of the art institution’s trustees. (No permanent solutions were found.) And yet, even though the objects AWC created found an easy place within the established canon of political art, the discursive aspects of the group, staged within the museum, remained accessible only through an appointment in MoMA’s archive until a few years ago. In the ensuing years, various developments of “consciousness” have problematized the identificatory politics of the 1960s and ’70s. Deconstructivist and postcolonial thinkers have rightly argued that the AWC drew simplistic parallels between artists’ oppression and that of members of the underclass, such as blue-collar workers and slaves. Their propagandistic tactics promote both a violence of representation and an alienating, progressivist teleology. They have asked whose consciousness is favored over another’s and who the agent of raising consciousness is. As a result, social practice today has bifurcated into at least two clear strands, one looking inward to the politics of art production and one outward toward the art institution as a site for alternative political engagement. An activist group comprised of artists and cultural workers, W.A.G.E. are working collaboratively and in tandem with their own practices, to document the exploitation of artists and to create a best-practices standard for how art institutions should compensate them for their labor and for the reproduction of their works. Other artists have utilized the resources of the museum to facilitate grassroots political organizing, often divorced from the sites of the problems. The challenge that consciousness raising continues to pose is one that has haunted the avant-garde for more than a century: In what form (or under what conditions) can political content—discursive or otherwise—best be sited? Wendy Vogel is a writer, editor, and occasional curator based in New York.